GreekShops.com : Greek Products : Delicatessen & Prepared Foods : Trata Wild Caught Aegean Sea Anchovies in Olive Oil 100g. 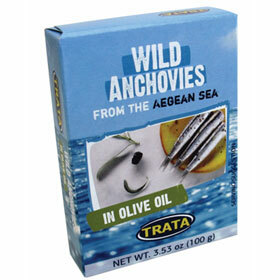 [Code : 5201340004009] Trata Wild Caught Aegean Sea Anchovies in Olive Oil 100g. Wild Caught Aegean Sea Anchovies in Olive Oil 100g. A delicious meze for any Greek table. Delicious wild caught anchovies from the Aegean Sea, packaged in pure Greek Olive Oil. Perfect for your Ouzo!